In the past it was necessary to spend a lot of time analysing the trace listing in order to find out which instructions, data or system states had caused malfunctioning of the target system. Now Trace-based Debugging - CTS for short - allows the user to recreate the state of the target system at a selected point based on the information sampled in the trace buffer. From this starting point the program steps previously recorded in real-time in the trace memory can be debugged again in TRACE32 PowerView GUI. Any record in the trace can be selected as starting point for Trace-based Debugging. 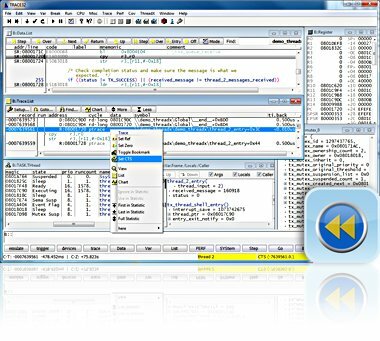 When the reconstruction is finished the program steps previously recorded in real-time in the trace memory can be debugged again in TRACE32 PowerView. The fact that TRACE32 can reconstruct the register and memory contents for any trace sampling points allows the user to display a full high-level language trace including all register and stack variables. The Trace-based Debugging technology enables TRACE32 to fill in most of these gaps. These records are marked as "s"ynthetically reconstructed (exes instead of exec in the example above).